Please look below to find links Pages 2 and 3 where you will find Dwarf miniatures and Green ooze miniatures. All copy rights are the property of Scott Richard / Modeler's Attic and are not to be duplicated. I found a very good artist by the name of Scott Richard and he lives in Ontario, Canada with his wife of 12 years. He is a self-taught freelance sculptor, and has never attended any formal art training...just learned on the fly you might say. He has done a few private commissions, and is adding to his portfolio constantly. He recently won the King Kong likeness competition over at WETA COLLECTIBLES. I could see his talent and offered him a chance to help out Modeler's Attic, and offer a few mini's to collectors. The rest is unfolding now as you read this Scott is adding detail to his new sculpt. We are always sculpting more, and more. Scott does his thing, and I do mine. The best part is, you can now enjoy a few miniatures from a great artist. 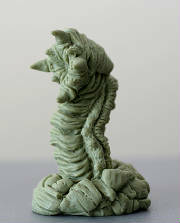 I will keep sculpting the little things here in Texas, while Scott works his magic on his new sculpts in Canada. This page will soon fill up with all sorts of miniature characters, creatures, and monsters. Perfect for dangerous ground areas. Got anything you need to trade with this guy? 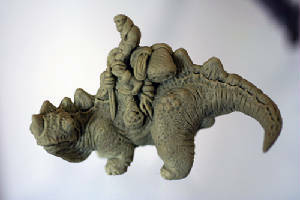 New sculpt on the way by Scott Richard. Full of detail for your terrain. I got it, and just made the mold. If you ever had a idea for a large statue, here it is for you. 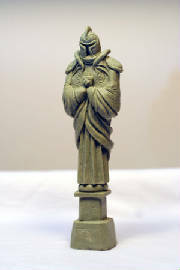 I just posted the painted casting I made off his cool master green. As usual I went way beyond just painting. I made a huge gate which is now available by special order. I could not resist making it, and now you can have one too. Also, yes the gates swing open and shut. I am still building this page, which is going to be mainly sculpts by Scott Richard. Perfect for those alien planets, enter the BORE! Perfect for a town square, ancient border marker, or a gate like the one below. It is 6" tall with no distinct markings, so you can use it with all sorts of armies. This is a sample of what can be done. The mini is a well known Warhammer 28mm wizard. from the ground only when it knows you are too close to flee. Perfect for areas of dangerous ground in a Sci-Fi game. This is a miniature with attitude from Scott Richard. Pre order now for $5.00 each.